Pilates for Dummies or Not so Dummmies! Pilates for dummies is not just for dummies... It's for people who are smart and looking for the best way to get started doing Pilates movements safely and effectively. If you are wondering how to do Pilates for dummies this site has loads of free information and exercises to get started right now. You have access to beginner through advanced level progressions of Pilates exercises that will keep you and your body healthy for years to come. Pilates benefits are many and helpful for all ages and abilities. I know, because I work with people age 2 years through 90 years old and there are exercises for every body. For instance...If you have trouble, like most people, doing a proper Pilates Roll-Up then check out this article to take you through the many progressions to do this exercises safely and effectively. Maybe the leg circles are your Pilates nemesis and you just can't keep your pelvis from rocking and your hip flexors from burning. Check out this article to find out how to do Pilates Leg Circles with grace and ease of movement. Think you are a dummy and can't coordinate yourself to work on the Pilates Reformer? 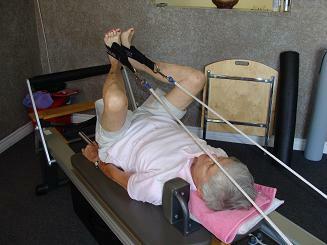 Well...check out this woman in her 80's working the feet in straps on the reformer. If you want to find out more ways to use the Pilates reformer for your legs and upper body check out this page with videos and more information to get you started. My favorite and one of the most fundamental Pilates moves is shown here, and you can find the bridge in a video from this page. Once you learn to do this basic Pilates move of articulating and opening the spine you will love to do the many variations of the hip bridge to strengthen and stabilize your pelvis even more. Leave Pilates for dummies and find out more about how to get started in my newly revised Pilates Ebook here with 3 levels of progressions.